The 29th season of the famed Welk Theatre, which underwent a lobby remodel in 2018, also features Tony Award-nominated “The Addams Family,” which will run Sept. 6 to Nov. 10, and Larry Raben’s new “Welkome Home for the Holidays!” running Nov. 22 to Dec. 29. Weeklyvariety shows featuring popular classic rock tribute bands (The Eagles, Beatles and Neil Diamond) round out the season. 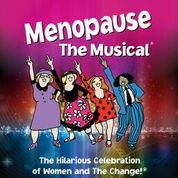 “Menopause The Musical” is set in a Bloomingdale’s where four women meet while shopping for a black lace bra at a lingerie sale. After noticing their similarities, they joke about and bond over their woeful hot flashes, mood swings, wrinkles, weight gain and celebrate that menopause is no longer “The Silent Passage.” The Welk Theatre production runs March 15 to June 2 and features a powerhouse cast of Anise Ritchie, Eileen Bowman, Melinda Gilb and Bets Malone, directed and choreographed by Natalie Nucci. “The Addams Family,” running from Sept. 6 to Nov. 10, is a new musical comedy with music and lyrics by Andrew Lippa and book by Academy Award winner Marshall Brickman and Tony Award winner Rick Elice. The show is based on The Addams Family characters created by Charles Addams in his single-panel gag cartoons, which depict a ghoulish American family with an affinity for all things macabre. “Welkome Home for the Holidays!” is a musical celebration written and directed by Welk Theatre alum Larry Raben. The show celebrates the most wonderful time of the year with swinging sounds of traditional songs blend with newer influences, making the perfect entertainment for the whole family. Full of heart, humor and amazing performances, this show is a must-see to put a smile on your face, get your toes tapping, and put everyone in the holiday spirit. Performances will be Thursdays, Saturdays and Sundays, Nov. 22 to Dec. 29. The 2019 season also includes variety shows, performed by different acts throughout the year, every Wednesday evening at 7 p.m.
Southern California’s number one Beatles tribute show, will take the reins June 5 to Aug. 28. The Alley Cats, America’s favorite Doo-Wop group serving up a perfect blend of 1950s & 60s hits and hilarious comedy, will play Sept. 11-Oct. 30 and Next to Real Neil, a Neil Diamond tribute act performed by tribute artist Jason Lohrke, closes out the season Nov. 6, 13, 27 and Dec. 4, 11 and 18. This season will be the first full-year of shows since the Theatre closed for lobby renovations in January of 2018 and reopened in July. The remodeled lobby features a new bar and concession area, modern lounge seating, updated box office reception area and a new tribute to Lawrence Welk’s long-spanning career. The Lawrence Welk Resorts Theatre is located at 8860 Lawrence Welk Drive in Escondido, California. For tickets and more information, visit welkresorts.com/san-diego/theatre. For ticket information, visit SanDiegoTickets.WelkResorts.com or contact the Welk Resort Theatre Box Office at (760) 749-3448 or toll-free at 1 (888) 802-7469. For group reservations of 15 or more, call (760) 749-3182 ext. 22154.